At a little over seven seconds France's lasts the longest but America's is by far the biggest. 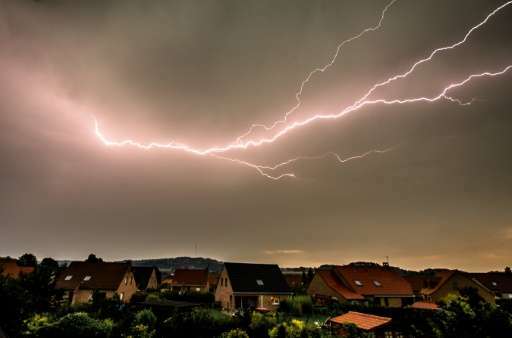 The UN World Meteorological Organization on Friday announced that France held the record for longest-lasting lightning bolt, with a flash on August 30, 2012 in the southeast of France lighting up the sky for a full 7.74 seconds. The horizontal bolt travelled 200 kilometres (125 miles), the WMO's Rapporteur of Weather & Climate Extremes, Randall Cerveny, told AFP. "It was a "cloud-to-cloud" discharge," Cerveny said. France was bested, however, in the distance stakes by the US. A lightning strike on June 20, 2007 in the state of Oklahoma covered a distance of 321 kilometres, the WMO said. Wow. Congratulations for a super-stupid article. That french thunderbolt obviously hurt someone's patriotic feelings. We all know you are so confused BartV.. but it's ok since you didn't evolve. Thanks for addressing the emotionally attached religious zealots such as BartV, they need education !